Homeschooling takes storage. That is something that I didn’t really think about when I decided to fall down the rabbit trail into homeschooling. curriculum takes space. 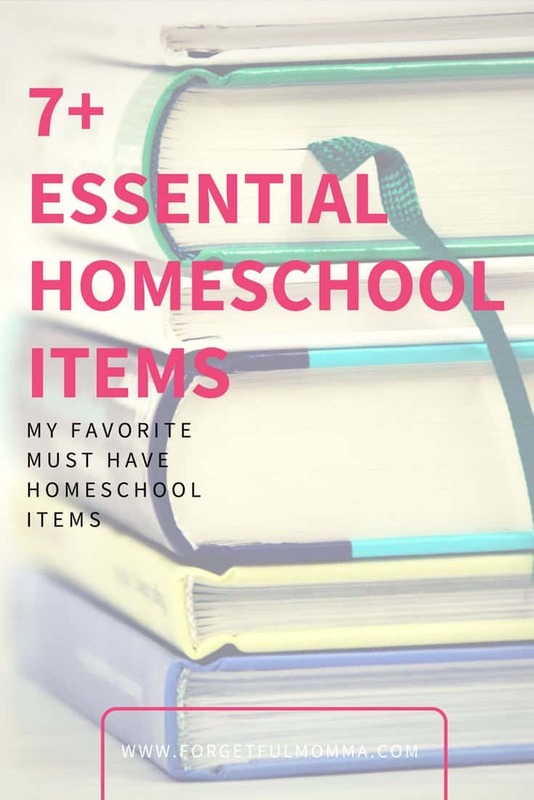 Even if you don’t have full curriculum as we didn’t the first few years, it still takes space, and you a homeschool room isn’t always practical or even wanted. 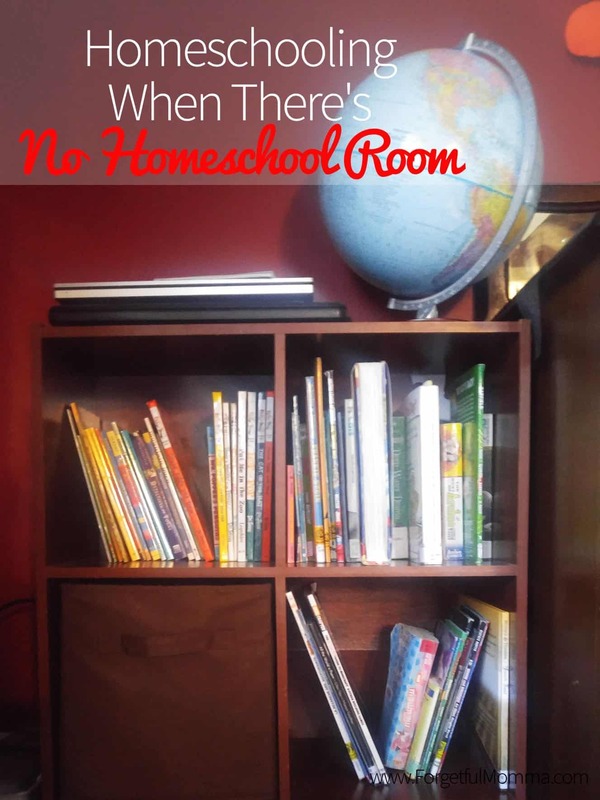 So how do you homeschool without a homeschool room? 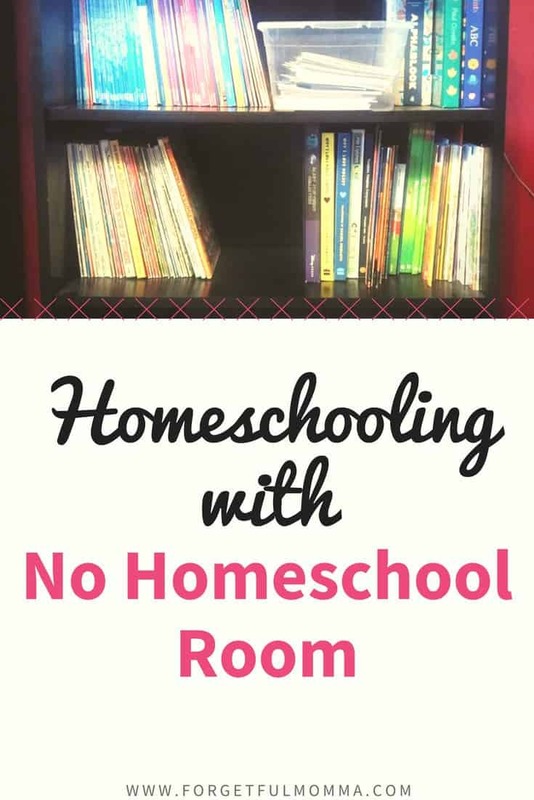 We do not have a homeschool room, no dedicated learning space in our home, or outside our home. There are a number of reasons to not have one, a lack of room would be the best reason! If I wanted, I could have one, it would just take a little work, a little rearranging in our a basement but I like not having a homeschool room. Learning occurs everywhere! Why limit you and your children to only “learning” in a specific room of your home. Math is fun in the kitchen cooking and baking for example. Teaching them around my kitchen island changes things up, plus I can easily walk around the island helping them and not have to bend over the table. Our dining room table is big enough that we can spread out all of our BookShark books and still see everything. Get out of the house all together. Head to the park or library and do some school there. Grab a backpack, toss some books, pencils and erasers and learn where ever you go. I have been a book lover since I was a teen, and that requires bookshelves, which is important as a homeschooler too. If you don’t want you home to look like a school room, which was my goal, you just need to be a bit creative. I wanted our home to be a home, and as we plan to sell someday not have to worry about it when the time comes to list. When we bought our house, it came with an old dining room “hutch” as we call it, which houses our board games. It’s directly behind our dining room table which is the perfect place to play board games. We have two 6 Cube Storage Organizers, and a small book shelf in our open concept dining room/living room. 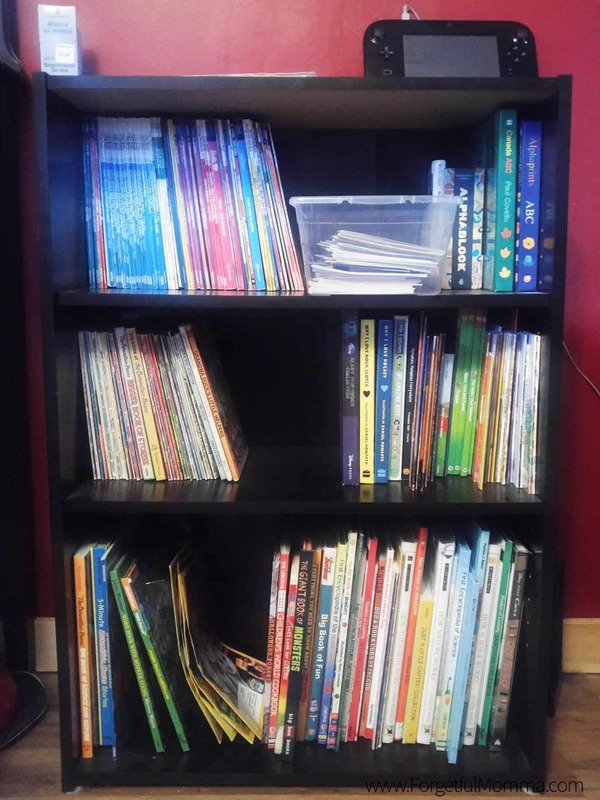 The bookshelf is FULL of children’s books, their leveled reading books, our Berenstain Bear books and more. One of our cube storage is used for library books, coloring books, and crayon/colored pencil/etc. storage. The other is for the rest of our homeschool curriculum – BookShark Reading with History and Science books and science kits (two of the cubes). We have one cube with a box in it filled with math manipulatives. Another cube with a box houses our pattern blocks, magnifying glasses, and such. And if you kept count that is only five, shhhh, I have one box empty and just waiting for more homeschool stuff. I love red, and hubby one day saw this two door cabinet in red on clearance and brought it home for me. I love it! Do you know what I have in it currently? 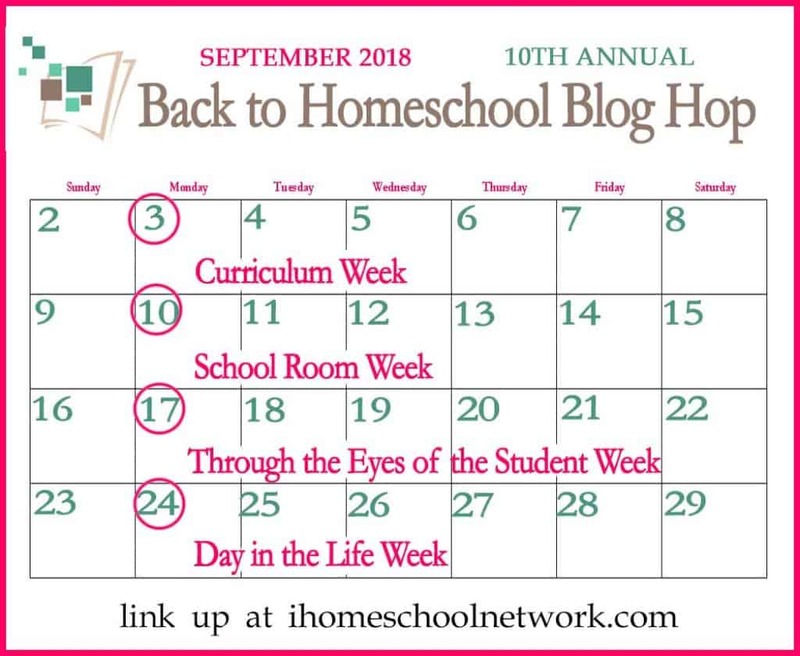 Homeschool stuff! 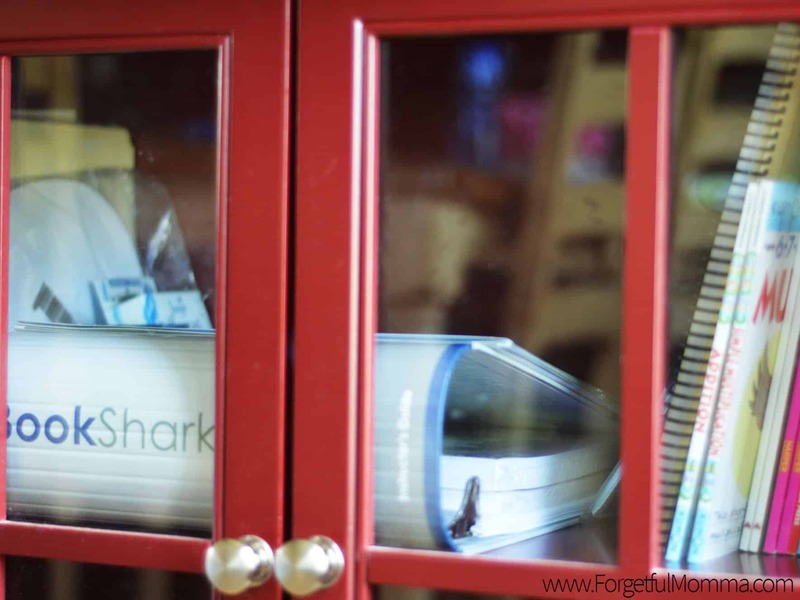 We keep our BookShark binders in here, along with our other curriculum.